Note: The boot drive (ElCapitanSSD) had El Capitan 10.11.1 installed on it and the target drive (MacintoshHD) had Yosemite 10.10.5 installed on it. The only difference here is the folder name i.e. OS X Install Data instead of .IABootfiles. And after all required files are extracted from the DMG and are saved in the target folder, then your computer will reboot. The firmware will then load/execute boot.efi which will fail, of course… if that isn’t the 32-bit one! But I have yet to find its content. What this does is actually quite simple. It checks for changes/removal of the files in the above list (see array) and when that happens it triggers the daemon, where we can restore the file(s) that we want to use. This should work for the first two file in the list (array) – so that you don’t have to modify the DMG(?) – but I don’t know if it also works for the other two files. We need to verify this. And if it doesn’t work, then we can boot from the RecoveryHD and replace the files. That won’t return anything on the ‘normal’ copies of boot.efi. Only the extracted and renamed copies of bootbase.efi includes the name. Another way is to check the “booter-name” property with ioreg. Update: Confirmed to be working by mikeboss! 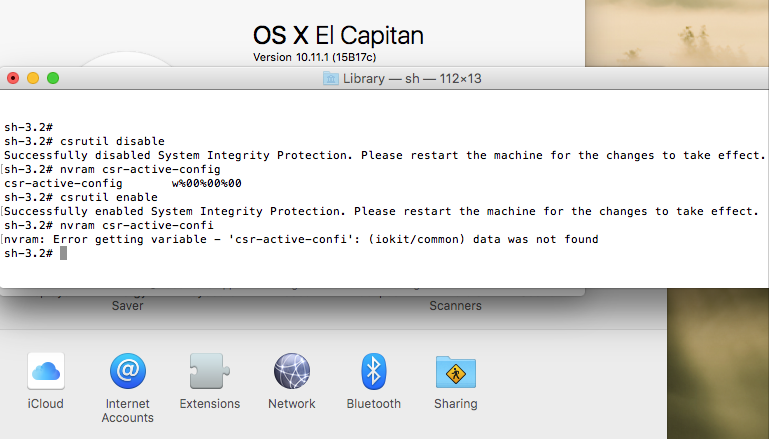 El Capitan support for unsupported hardware is here! A little over a month ago I blogged about El Capitan support for macosxbootloader and today, after 80 hours of research and development, I released two versions of boot.efi for El Capitan. One with a black background and a white Apple logo, and another one with a grey background and Apple logo. You can read more about this project for El Capitan here. Note: I should have added that using -f (flush caches) is no longer supported, and using it will throw a KP. In short. Please wait for me to add support for it (see development phase 3). That’s El Capitan without workarounds like using FileNVRAM.kext or replacing/patching AppleEFINVRAM. This was a bit of a surprise to me, but Apple released the xnu-2782.40.9 source code – among others – used in Yosemite 10.10.5 No idea if this happened before – not that I recall – but a new update of Yosemite may soon be released. Otherwise this is a totally unexpected move from Apple. Oh and a new version of kext tools (384.30.2) is also available for download. Too bad that this isn’t the latest. Oh well. We can’t have everything at once. SIP about to change once more? Update: It is already used/checked in function csr_check() in bsd/kern/kern_csr.c (XNU kernel source code) to set csr_allow_all to 1 if it is set. More importantly. 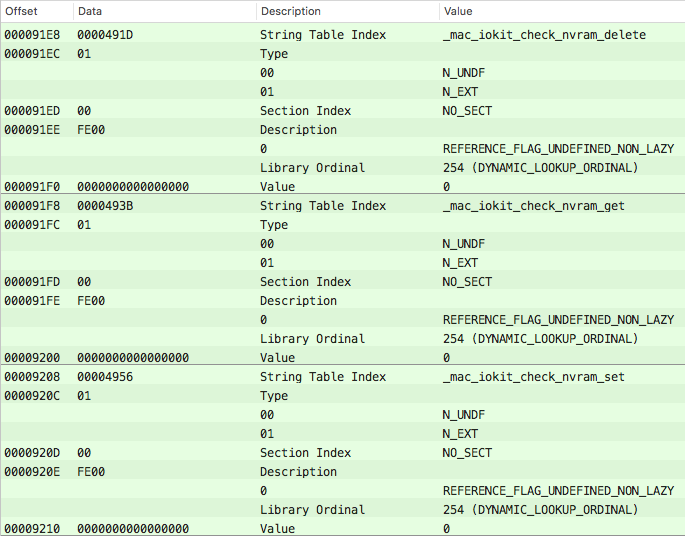 AppleEFINVRAM has two calls to csr_check() with this value. One in AppleEFINVRAM::setProperty(OSSymbol const*, OSObject*) and one in AppleEFINVRAM::removeProperty(OSSymbol const*, bool). There might be more executables that use this value, but at least now we know what it is that blocks nvram settings from being stored. I mean entitlements alone are not enough. We know this because csrutil is in fact entitled to set csr-* properties, but not from all partitions. I also asked folks in the Clover general and Chameleon threads over at insanelymac.com if they used this value, but nobody replied yet. I presume that they don’t know what this value is used for, and why they should test it. Well. Never mind then.